Our mission is to explore for evidence of prehistoric occupation and to identify, record, photograph, and preserve such physical evidence that will help us to reconstruct as nearly as possible the manner in which people lived during any cultural stage; and to identify occupational strata. Excavation of a known American Indian site is serious business. Remember that in the process of uncovering a level where Indians are known to have lived (occupation level), we also destroy the setting and the critical evidence it contains. By now, most Lycoming County Indian sites are known either because relics have been found on them or erosion of stream banks has uncovered campsites (heat shattered stones from fireplaces are especially apparent at such sites). Indians selected habitation sites much as we would if we wanted to camp in a dry location close to water, good hunting and fishing. In the case of the Indians of the later Woodland period, sites would be found where good crop growing soil exists. After we have determined that an occupied prehistoric site exists, we need to plan the actual excavation. 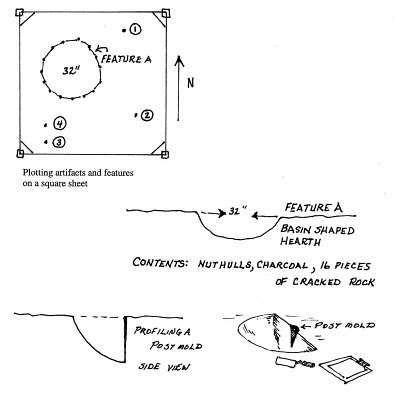 In the case of Canfield Island, a site reports exists that summarizes evidence found on other parts of the island and interprets the significance of the evidence as far as present knowledge permits. How can we add to the data pool now? The greater the data base, the more reliable the conclusions. With this idea in mind, we can learn the principles of excavations while at the same time adding to that which we already know about the site and its inhabitants. 1. We first lay out a grid of working excavation units (5' x 5' or 10' x 10' squares). We anticipate that as we dig, we will discover a stratified site (occupation levels layered one atop the other with sterile or non-occupied levels in between). 2. We next form a disciplined work crew who will excavate according to the methods described here. On this paper, we can only describe the most elementary procedures; more involved instruction will occur during the excavation process. 3. We each have a pit or square sheet to record information as we excavate. 4. We save all artifacts and debitage (stone or lithic refuse or debris) by storing them in marked paper bags and taking them to the Thomas T. Taber Museum of the Lycoming County Historical Society in Williamsport. We also gather the fire cracked or shattered rocks to study, then record the number found (on the square sheet); we do not keep them as part of the permanent inventory since storage space is limited. 5. We pay special attention to features such as burials, hearths, postmolds, and pits. We excavate them intact or in situ, without removing anything from its original position until it is measured, described in writing, and photographed. We save contents of hearths and pits for wet screening at the site. 6. We sift all excavated soil from an occupied level that can be sifted; where sifting is not practical (such as with clay soil) we use a scraping technique (rabotage) with our trowels to locate artifacts. 7. We plot every artifact and feature on the pit sheet. This will be described later. 8. Upon completion of the excavation, we give all artifacts and square sheets to a designated person to be taken to the laboratory for further study, tabulation, and cataloguing. A grid is simply a series of excavation units placed in such a way that they straddle the presumed evidence beneath the ground. Of course, we can only guess at this since we do not know the location of trees or other obstacles to settlement that might have existed in prehistoric times. The permanent datum point is the location from which all measurements on a site are made. It may be a survey beacon or a landmark that appears on a large map. The grid also has its own datum point, tied in with several benchmarks. Bench marks are reference points made on objects considered permanent. In this way, the site may be located again after it is back-filled upon completion of excavation. All elevations and directions are read with regards to the site datum. 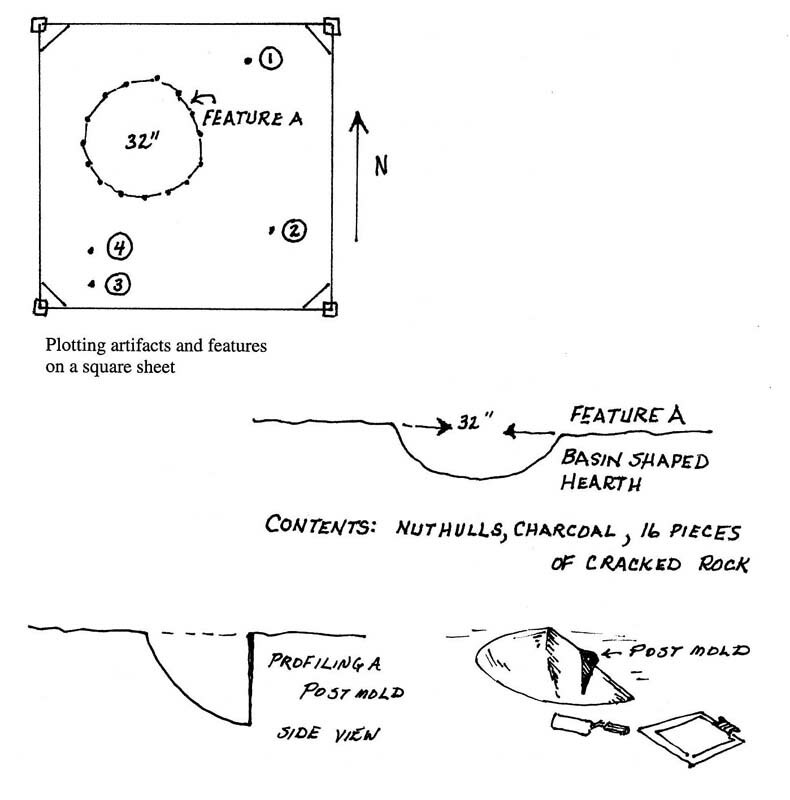 Test pits are frequently used to determine the extent of archaeological deposits at a site. They consist of small excavation areas designed to penetrate to the lower strata of a potential site to retrieve samples of the artifacts in the lower layers. They are basically preliminary to larger-scale excavation. Carefully placed test pits can provide insights into the stratigraphy and artifact content of a site before larger scale excavation begins. The chapter provides a steel field kit in which we keep certain cumbersome tools used during excavation. The kit is locked when not in use and is a handy place to store shovels, trowels, kneeling pads, sieves, wooden marker pegs, stakes and the like. The chapter also provides record sheets, Kraft paper bags, twine, 8-foot measuring rods, small sieves, and other necessities. A good medium weight mason trowel, preferably blunt-nosed instead of pointed. A shovel with a flat face rather than rounded. Measuring tape for plotting artifacts. A pair of work gloves. A ball point pen or good lead pencil. A clipboard or similar writing surface. The following items are important but are only used as needed and are either furnished or acquired. Excavation methods differ according to the nature of the site and our objectives. We use 5' x 5' squares or 10' x 10' squares depending upon these objectives. When the grid is laid out, four stakes will bind each square. The northwest corner stake identifies your square. The stake is marked with a black line indicating ground level. You will take all depth measurements from that line. Six inch corner balks are left around each stake to prevent the corner from collapsing. You will begin your unit by marking on the ground the actual outline of the square. We dig or sweep to a depth of four inches at a time. When we encounter an occupied level, we expose and explore the entire stratum regardless whether features such as pits or postmolds go deeper than four inches. The first level that extends ten or so inches from the surface is called the plow zone. The soil in this area has been disturbed and any artifacts are out of context. The plow zone may also contain modern debris often carried in by flooding. We save artifacts from this zone but do not plot them on our square sheet. We plot all artifacts below the plow zone on the square sheet for the level we are excavating. We use a separate square sheet for each cultural level found. Never record two levels on one square sheet. When plotting artifacts, you will determine depth by measuring from the ground level mark on the northwest stake and determine horizontal location by measuring from two adjacent sides. Artifacts are humanly manufactured or modified objects. Features are evidence that cannot be removed from the ground, such as postmolds, hearths and pits, usually apparent from patterns of discolored earth. Features such as pits and hearths are first excavated in situ, that is, by leaving all elements of the feature in their original positions so that we may observe the way the feature looked at the time of Indian occupation. After we have examined, measured and photographed the feature and recorded the information on the back of the square sheet, we excavate the feature, saving the matrix for possible wet screening. Finally, we outline it with a series of pegs, and plot the location of each peg on the square sheet as we would for individual artifacts. We then sketch the outline of the pit on the square sheet and sketch its vertical profile as well. When we encounter a possible postmold, indicated by a dark circle on the surface, we profile the feature by cutting it in half, removing soil from one side so that we may note the feature's vertical configuration. If it tapers to a dull point, it is most likely a postmold. If the dark area meanders in another direction or slants off to a side, it is most likely a rodent hole. Sometimes, as in the case of burials, all three of these come into play. There are also other things we look for, especially food remains such as nut hulls, carbonized seeds, and bone refuse from butchering. Because of the acid nature of local soils, however, very little bone remains. Very little naturally deposited stone occurs on Canfield Island since water traveling over brush covered landscape during flooding travels too slowly to carry anything but small pebbles. Humans would have deposited most stones found. Please examine every stone you find. Look for pitting on opposite sides or evidence that it was in a fire. Check to see if it was ground flat on one or both faces. Note where you found it, whether it was near a fire pit or hearth. If a stone shows any of these characteristics, chances are an Indian used it. If its shape indicates it was chipped for some purpose, such as for a projectile point, net sinker, pestle, celt or axe, it is an artifact. There are many possible tools you may find. The tools you do find will help you identify the cultural level you have reached. For instance, ceramic or pottery evidence will only exist from the Transitional Cultural Period (3,500 years ago) upward. To prepare yourself to recognize different pottery types (you will only find the sherds), study the types in the American Indian Gallery of the Taber Museum. While manufacturing tools, the American Indian produced considerable waste products of chert, shale and other lithics. These flakes are usually sharp with one small edge flattened. The flattened edge is the face or "platform" where the worker struck a blow that dislodged the flake. Some large flakes show edge wear indicating they were probably used as cutting or scraping tools. Many such flakes are found around hearths where the Indian re-sharpened his tools near the only nighttime light source. In their early stage of manufacture, some tools were roughly shaped at the quarry to reduce weight for transport. Worked on both sides, these blanks are referred to as bi-faces. An increasing abundance of charcoal flecks in the earth usually tells you that you are approaching a living floor. Sometimes the charcoal colors the ground dark and its presence always suggests human activity. As previously discussed, patterns of dark, small round circles in the ground might be postmolds. Postmolds are the remnants of an Indian structure such as a house or platform. Indians built these structures by driving narrow poles into the ground. After use, when the poles rot away, the hole fills with dark humus-rich soil. On the wall of your excavation unit, you may see a dark band that indicates where you cut through a living floor. A combination of darker soil, charcoal, chipping refuse, and fire-cracked rock are sure signs that you have reached a living floor or stratum. Your square sheet equates with the square unit in which you dig. Unless you are willing to keep accurate records on your square sheets, never start to dig. An incomplete square sheet is usually worthless when it comes time to tabulate the data. Note that on your sheet is one large square divided into smaller squares. Each small square equals one foot of your excavation unit. 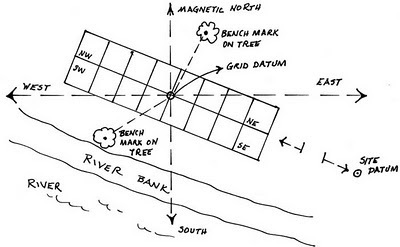 The top of the sheet indicates magnetic north, the left side is west, the right side is east, and so forth. Each square foot is divided into 144 still smaller squares representing square inches in your excavation unit. When you plot an artifact for any given level, first determine its depth by measuring from the ground level marker on the northwest stake. Next, measure from two adjacent sides and mark the location on the square sheet. Number the find on the square sheet such as 1, 2, 3 and so on. Describe the find, its depth and anything important you observed about it. A feature such as a pit is first excavated or uncovered in its original position. By this we mean that you try not to disturb anything solid from its original position until you have exposed the feature as a unit. We will then plot and photograph the feature before excavating its contents. You will define the perimeter of the feature with a series of pegs, each placed about 6 inches from the other. You will measure from adjacent sides of the square to the pegs and plot them on your square sheet as if each were an artifact. You may then draw an outline of the feature on your square sheet. After you remove, study and count the feature's contents, you will draw a cross sectional profile of the feature on the back of your square sheet, giving basic measurements of depth and diameter. Also draw the slope pattern of the sides and describe them. Indicate the feature with letters of the alphabet - A, B, C, etc. The contents are usually saved for wet screening (see section on wet screening). Small features such as postmolds are recorded as to diameter and depth with a description of depth and taper, etc. You should profile the postmold as previously described. When you complete the level and its associated square sheet, turn in the square sheet and the artifacts for that level all at once. If you are lucky enough to find artifacts on a level, you need to follow one more critical step to complete your work: marking your finds. In this way, we may identify your artifacts with the square sheet should the two become separated. We mark only artifacts, not chips or debitage. Save all chipping refuse, however, for it also has an important story to tell. The first step in the curation process is to thoroughly wash your artifacts. An old toothbrush will make it easier. After that, mark each artifact with either a fine tip marker pen (felt nib) or with white ink. And 4 or 6 is the level number. Don't be afraid to ask for help. Do not mark or save fire-cracked rock, other than to pile it near your square; count all pieces larger than a hickory nut and record the number. Place artifacts in 20 lb. Kraft bags marked with your name, your square number and the level number. Never put two levels in the same bag. Hand them in as soon as the level is completed. By now you surely know there are no unimportant steps in the digging process. Good Luck!